Air Force Rome Air Development Center [RADC] was tasked with engineering responsibility for the development of a spacetrack radar and sponsored a developmental contract with the Bendix Corporation. Bendix built the experimental L-band Electronically Steerable Array Radar (ESAR) that was the predecessor of the FPS-85. In November 1960, the Electronically Steerable Array Radar (ESAR) was powered up for the first time. This radar was capable of positioning a beam in space by electronic means, eliminating the need for mechanical antenna rotation. As the initial operational application of the phased-array concept, in which a beam from several transmitters was transmitted without the movement or rotation of conventional radar, the AN/FPS-85 would be the first phased-array radar developed to track objects in space. Generating a combined output of 32 megawatts, the AN/FPS-85 is said to be the most powerful radar in the world [not clear that this is in fact true]. The unique aspect of this radar is the phased array antenna technology. Unlike a mechanical radar, which must be physically aimed at an object in space to track and observe it, the phased array antenna is steered electronically by controlling the timing, or phase, of incoming and outgoing signals. This increases capabilities and decreases response time which allows near simultaneous tracking of multiple targets throughout the system's area of coverage. Radar construction began in October 1962 and testing was scheduled for May 1965; but four months prior, the building and all equipment were destroyed in a fire caused by arcing electrical equipment. The Air Force took ownership of the site in September 1968 with the 20th Surveillance Squadron, or 20th SURS, as the primary operator. 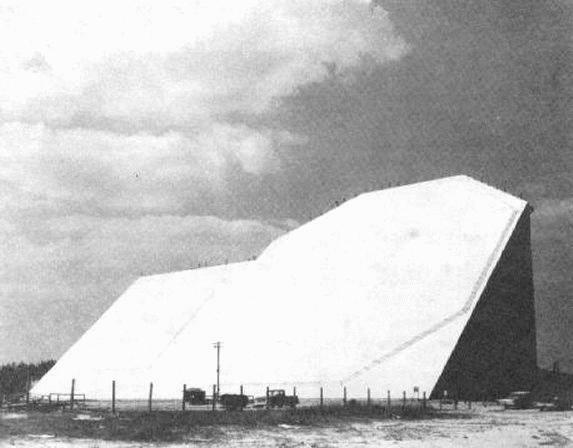 The Aerospace Defense Command's 14th Aerospace Force assumed operational control of the AN/FPS-85 Space Track Radar at Eglin AFB in late December 1968. Space operations began in February 1969. Bendix later became a part of Allied Signal, and their radar expertise faded and disappeared. This was the first phased-array radar system especially designed to detect and track objects in space. 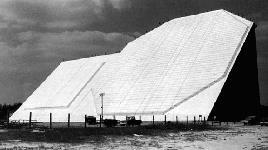 The physical structure of the system was 13 stories high, and the radar contained 5,134 transmitters and 4,660 receivers and utilized three computers. The AN/FPS-85 covers 120 degrees in azimuth and in excess of 22,000 nautical miles in range. The transmitter array contains 5,928 transmitter antennas in a 78 x 76 square array and 5,184 transmitter modules installed in a 72 x 72 square array. The receiver array contains 19,500 receiver antennas and 4,660 receiver modules. The AN/FPS-85 building is composed of the receiver side which is 192 feet long, 143 feet deep, and 143 feet high. The transmitter side is 126 feet long, 95 feet deep, and 95 feet high. Total floor space is 250,000 square feet, with 1,250 tons of structural steel, 1,400 cubic yards of concrete, and a total of 2,500,000 cubic feet in the building. A fire station is on site and fire fighting equipment includes a 12.5 ton carbon dioxide storage tank, two fire vehicles, three water pumps (2 electrical, 1 diesel) which can pump 1500 gallons per minute each, two water tanks (250,000 gallons each) which can provide two gallons of water for every square foot of floor space, smoke and heat detectors, and automatic door closures. Air conditioning equipment includes three 500-ton water chillers. Electrical prime power is available from Choctawhatchee Electric Cooperative. There are two 400 KVA uninterruptible power supplies; system power requirements are approximately 4,000 KW, and three emergency diesel generators (500 KW and two 400 KW). The computer room housed five IBM computers used in mission performance, communication and software development and testing. Also, two radar interface control equipment (RICE) cabinets provide a means to interface the mission computers to the radar. Communications equipment included two Message Distribution Terminals (MDT) and one Mitron magnetic tape unit. Each MDT terminal has a 486 CPU and two medium speed printers. The Patch and Test Facility consists of the cryptographic equipment, patch panels, test equipment, secure voice equipment, Defense Information Agency Network (DISN) equipment and the Node for the Space Digital Information Network (SDIN). Initially charged with tracking objects in Earth's orbit, new software installed in 1975 allowed tracking of submarine launched ballistic missiles. This became the main use of the AN/FPS-85 though still used to perform space tracking. The AN/FPS-85 played an active role in America's space program. From 1971 to 1984, the site was home of the Alternate Space Surveillance Center. It provided computational support to the Space Surveillance Center at Cheyenne Mountain AS, CO. If the need arose, the squadron operating the AN/FPS-85 could assume command and control for worldwide space track sensors. When that squadron integrated US Air Force Space Command in the early 1980's, the AN/FPS-85 became the proving ground for the Air Force's phased array radars. The new technology was used in new radars specifically designed and located for early warning of SLBM attacks. These PAVE Phased Array Warning System radars assumed early warning responsibilities away from the Eglin Space Track Radar. In 1987, the site returned to its original mission space surveillance. The site underwent a major transition, allowing Defense Department civilians to staff the majority of support and maintenance functions, while military people staffed the command section, orderly room and operations functions. The AN/FPS-85 can detect, track and identify up to 200 satellites simultaneously. The maximum beam deflection is 60 degrees on either side of the antenna center line which provides 120 degrees azimuth of azimuth coverage. The antenna is inclined +45 degrees for scan coverage of +3 to +105 degrees elevation. Generating a combined output of 32 megawatts, the AN/FPS-85 is the only phased array radar capable of tracking satellites in deep space orbit. A study was conducted in 1976 by the Air Force Rome Air Development Center to determine the feasibility of extending the AN/FPS-85 radar performance to synchronous ranges. Several modifications involving mixed integration, coherent integration, and transmit power increases were examined considering the target effects of six typical objects and considering the Faraday rotation propagation effects. It was concluded that the AN/FPS-85 radar can achieve synchronous capability at a relatively modest cost and with varying levels of radar time penalty depending upon the modification and target of interest. The radar can track an object the size of a basketball at a distance of more than 22,000 nm. The 20th SPCS operates and maintains the AN/FPS-85 Phased Array Radar, the only phased array radar dedicated to tracking more than 16,000 near-earth and deep-space objects. The AN/FPS-85 Phased Array Space Surveillance Radar provides space situational awareness for U.S. STRATCOM's space control mission area. It is one of 29 sensors that comprise the global Space Surveillance Network, or SSN, and is the only phased array radar dedicated to space surveillance. It collects more than 16 million observations of satellites per year, accounting for 30 percent of the SSN's total workload. Data from the system is forwarded to U.S. STRATCOM's Joint Space Operations Center at Vandenberg Air Force Base, Calif., and the Alternate Space Control Center at Dahlgren, Va. In February 2003, the unit was again re-designated, this time as the 20th SPCS. In October 2004, a detachment was activated under the 20th SPCS at Dahlgren, Va., and the unit assumed control of the U.S. Navy's AN/FPS-133 Space Surveillance Radar Fence and the Alternate Space Control Center. Nearly 40 years after operational acceptance, the unit's mission is more robust and critical than ever. On August 09, 2004 ITT Industries, Colorado Springs, Colo., was awarded a $5,351,972 cost-plus award-fee contract modification to provide for System Engineering and Sustainment Integrator (SENSOR) to integrate system engineering and sustainment of ground-based missile warning, missile defense, and space surveillance sensors. The SENSOR systems currently include ground-based radars and optical systems controlled and operated by United States Strategic Command and Air Force Space Command. This modification executes Implementation Planning and System Requirements Definition Phase of the Eglin AN/FPS-85 radar System Life Extension Program (SLEP). The contractor will include the development of a performance based system specification that is based on the Eglin Operational Requirement Document and which includes the performance requirements for the Eglin radar and its operation as an integral part of the Space Surveillance Network. The requirements analyses and specification development for the Eglin SLEP during Phase One and to design, build, field and test the actual SLEP radar during Phase Two. 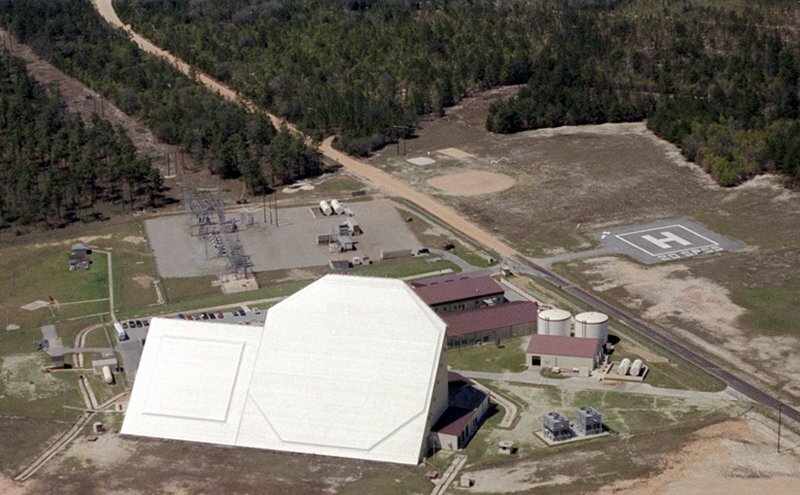 Phase 1, which is being incorporated into the contract and funded with this modification, is to develop a formal proposal that will define the estimated costs, processes, required resources and personnel required to delivery all hardware, software, training and documentation to ensure the Eglin Radar SLEP met the 15 December 2004 deadline for the start of the system deployment phase. At this time, $1,606,810 of the funds has been obligated. This work will be complete by December 2004. Negotiations were completed June 2004. The Electronics Systems Center Detachment 5, Peterson Air Force Base, Colo., is the contracting activity (F19628-02-C-0010, P00058). The SLEP effort will replace its aging, increasingly unsupportable radar processing components and establish a modern software architecture to enable radar operations, sustainment, and technology refreshes through 2028. Eglin SLEP extends the operational life of the AN/FPS-85 Radar, located at Eglin AFB, through 2018. Upgrades the hardware and software of the radar system to maintain system performance, operability and sustainment to support USSTRATCOM's Space Surveillance Network (SSN) near earth and deep space metric tracking and space object identification (SOI) missions. FY 2011 Accomplishments: Performed integration and testing of the Phase 1 portion of the SLEP - Control and Signal Processor Upgrade (CSPU). Design and development of Phase II, Beam Steering Control Upgrade (BSCU), which replaces radar system components that have become obsolete and are no longer available. FY 2012 Plans: Complete Phase 1 of the SLEP-CSPU integration, test, and operational acceptance. Continue BSCU design and development, and begin Phase 2-BSCU production and fielding. Primary Function: : Space surveillance and reconnaissance. All weather, day and night detection, tracking and identification of manmade objects in Earth orbit Looking to the south, the AN/FPS-85 can see up to 80 percent of all the objects in space each day. Volume of Radar Building - 2,500,000 cubic feet. Weight: Structural steel - 1,250 tons, Concrete - 1,400 cubic yards. Air Conditioning Equipment: Three 500-ton chillers with two cooling towers. Electrical Power: Prime power generated from commercial sources. Two 250 KVA Uninterruptible Power Supplies and three emergency diesel generators - 500 KW and two 400 KW - provide backup facility power. Transmitter Array: 5,928 transmitter antennas and 5,184 transmitter modules generating 32 megawatts of combined power. Receiver Array: 19,500 receiver antennas and 4,660 receiver modules. Computer Room: Two IBM ES-9000 mainframe computers, two RADAR and Interface Control Equipment cabinets, and two SunSparc workstations. Communications Equipment: Two Message Distribution Terminals, four medium speed printers, one magnetic tape unit, cryptographic equipment, patch and test equipment, secure voice equipment and a satellite earth terminal. Crew: Three military and three DoD civilians - crew commander (officer), crew chief (NCO), space console operator (airman, radar maintenance technician (DoD civilian), computer/communications center operator (DoD civilian), and motor control center operator (DoD civilian). Date operational: January 1969; deep space capable 1988.